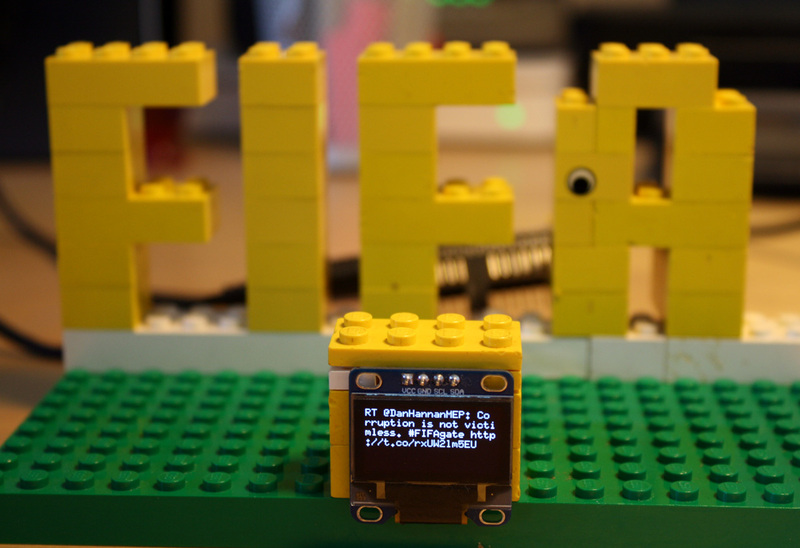 You are at:Home»Common»ESP8266 contribution from Zurich to #FIFAgate: At least data is not corrupt! I recently discovered the Node Red tool and almost immediately fell in love. I was about to write something like that myself when I found out about it and so far it does everything the way I would expect it: you could call it if-this-than-that for your home automation/internet of things projects. My first little project was to pass on a twitter feed through MQTT to a NodeMCU ESP8266 module with an attached OLED display. It was super easy and even more versatile than I expected. I can now shift away the logic from the ESPs which are always short on RAM to the central node running on a Raspberry Pi. The stream can then easily be setup in the browser. As soon as you press “deploy” the changes will become visible on the OLED display. I also started using Node Red to do all my "heavy lifting" .It runs on a rPi2 along with Mosquitto with WebSockets. You're right – this lets the ESP modules just do one thing. That sure keeps things simple. 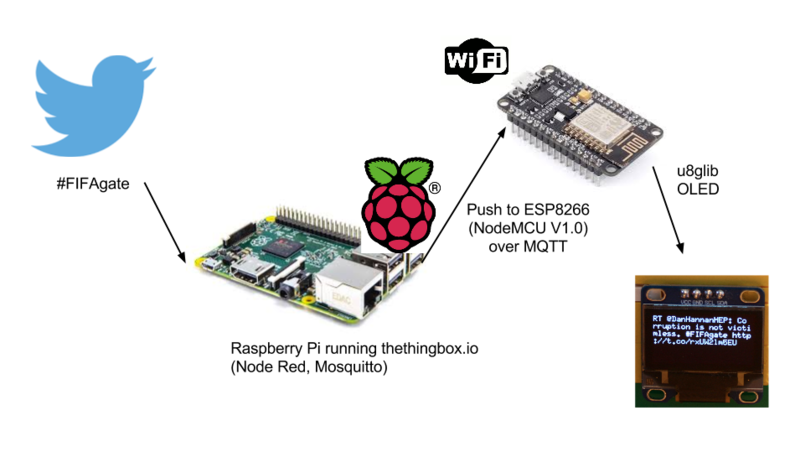 I have sensors that monitor temp, humidity, barometric pressure, vibration, light, presence (PIR, ) control mains outlets, control LED strips, etc – each ESP just doing one or two simple tasks and listening to or publishing to mqtt. I also have made two "mqtt Message Centers". One is written in Lua and uses the .96" i2c oled. It listens to my root topic – "home/#"
It displays the last two topic/payload pairs and scrolls them up as more come in. The second one uses an i2c 4×20 display. The little .96" is pretty hard to read with my old eyes. It listens to the topic "home/msgBoard". "line 1, line 2, line 3, line 4" so Node Red just formats up whatever I want to display on it. I want to change that one to listen for another topic, like "home/setTopic". It would take that message and change it's subscription to listen to whatever topic I choose. I've also thought about having a scroll up, scroll down button that would let me scroll through the message history. Haven't figured that one out yet. That one's written in the ESP-Arduino environment. I'm going to make a few more of these to use like a message board for the family stuck to the refrigerator, etc. All this has really got me wanting to get a 3D printer to make nice enclosures!That's next on my hobby budget. Actually, it was your comment on the forum which made me try Node Red! So thanks for putting the idea in my head. I was almost starting to program sth like Node Red myself;-).